Biological control is an alternative to chemical control of plant-parasitic nematodes. This is largely due to public demand for biologically-based and environment-friendly management options for safer pest control. Such demands have had an important impact on biological control research expansion and funding. However, the development of any strain of a biological control agent for nematode control requires many years of research, experimentation, validation and safe-use tests before the biological control agent becomes available to farmers or is further developed by industry as a commercial biopesticide or bionematicide. Biological control potential can be unconstrained when biological control agents are used in combination with compatible integrated pest management tactics, which may include some chemical products and other biological control agent-based products that are currently available on the biopesticide market. 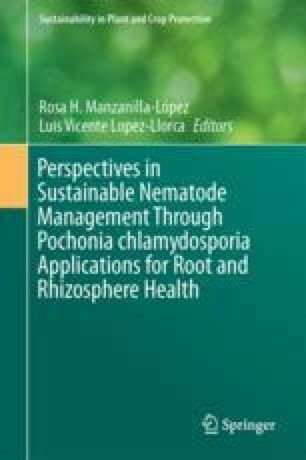 This chapter presents part of the history behind some of the initial studies that help to illustrate the scientific work carried out by the many scientists who laid the foundations and helped to develop Pochonia chlamydosporia as a viable, sustainable alternative to chemical control in the integrated management of plant-parasitic nematodes. The information of the MiCoSPa project outputs was kindly provided by Dr. Judith Pell. Larriba, E., Jaime, M. D. L. A., Nislow, C., et al. (2015). Endophytic colonization of barley (Hordeum vulgare) roots by the nematophagous fungus Pochonia chlamydosporia reveals plant growth promotion and a general defense and stress transcriptomic response. Journal of Plant Research. doi: 10.1007/s10265-015-0731-x.